I wasn't aware, after the facial, that the redness wasn't simply due to extractions alone. I thought it was pretty typical so I went home.. and applied... Vitamin A Gel. This was a big NONO. Even if you THINK you DO NOT have an allergy from a facial.. please don't do this till 24-48 hours later till you're certain. Because what this did was totally strip my skin of any moisture it had left and turned my face into the Sahara Desert... After this, my pores grew to 10x their normal size, my face got extremely itchy and more pimples actually APPEARED than before. Remember: Be it an allergy or not, please stay away from harsh chemicals/gels, masks, or scrubs. Let your skin heal first to be sure. If, unfortunately, you really do have an allergy like I did... then it's time for some soothing. For me.. off-the-shelf hydrating masks only made my skin more unstable. I do not know if the rest of you have ever experienced this, but brands like My Beauty Diary or bLiv did have some chemicals in them that aggravated my already wonky skin... So perhaps wait till your skin is more stable and in recovery before using them..
To counter this, I used a self-made mask with some cotton pads and Avene's Thermal Spring Water. In total, I used about 5 cotton pads, sprayed them till they were soaked, then placed them all over the affected areas of my face: my forehead, cheeks, and chin. This worked miraculously and my skin stopped peeling and stopped being red! Also, whenever my skin got itchy, I would just spray more Avene water over my face and pat it in. It worked better than anything else! I think you could use any type of thermal spring water you like, Vichy also has a pretty amazing one! Basically, anything with cooling properties like aloe vera would work well too! P/S: Perhaps 2-3 days after slowly recovering, I also started using a tiny drop of Cold Pressed Avocado Oil in the night before I slept, and this seemed to help a lot with the dryness! Remember: Less is more. Keep your skincare routine simple - maybe just wash your face and tone it with the Avene, Vichy, etc. Water first till your skin recovers. This flushes out the toxins in your body and also gives a healthy kick start for the day. If you want more information, then read this. This couldn't be better especially during a time you're suffering from an allergy. The "dirt" in your body gets out and you get to recover much faster. After which, during the day, perhaps set a mug of water in front of you wherever you are, and remember to finish it every hour! This should accomplish your 8 Cups of Water a day easily, and helps you stay well hydrated! Remember: There are so many benefits to simply drinking water, so please don't forget to drink up! When it comes to washing your face, be gentle! Using a cleansing milk might be the best option. 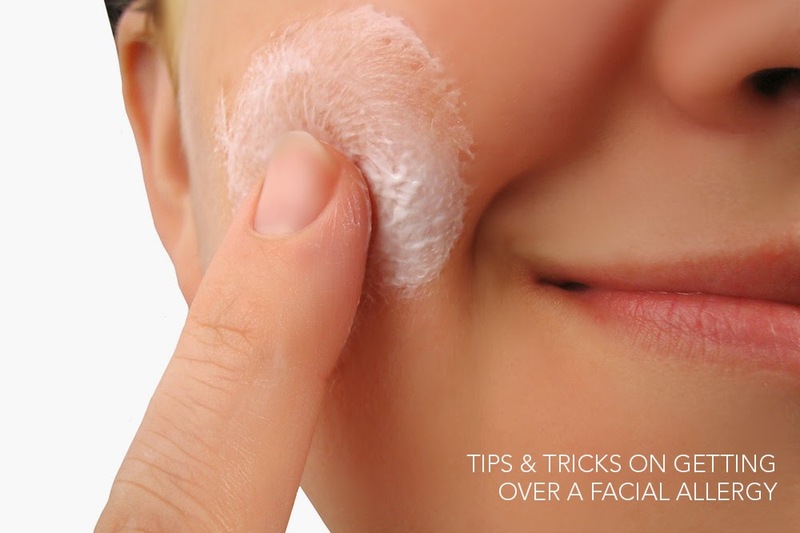 Try to stay away from anything that foams for the moment as your skin could turn drier! A cleansing milk is gentle on your skin and strips away the impurities without taking away your essential oils! Moreover, when massaging the milk in, don't use cleansing devices such as brushes (eg. Clarisonic), sponges, or muslin cloths in the meantime. Your fingers are more than enough at this point. They can even be abrasive if you put too much pressure! Your skin requires a lot of care at this point of time, so try your best to treat it as such. Remember: Do not aggravate the skin further with strong facial cleansers or devices. Lightly massaging with your fingers is more than enough and your skin will thank you. Ah I was so guilty of this during the week when my allergy first struck! I had events to attend and people to meet, so I felt that putting on makeup was necessary. Looking back, perhaps cancelling on those events would have been the better option for me. If you have no choice but to wear makeup to work, keep things light and simple. Perhaps a very very small amount of BB Cream and loose powder should suffice.. but please remember to cleanse THOROUGHLY when you get home. Personally, I am lucky enough to have a workplace that allows me to come in barefaced.. so I am highly grateful to that. If you could do that too then I highly recommend it! Remember: Makeup can make you look better temporarily and for that day - in the long run, you might regret it. Do weigh out long term vs. short term gain! I. FREAKED. OUT. This means I started testing with everything under the sun to get better, as opposed to doing what I SHOULD HAVE. Which was pretty much why my skin got worse before it got better. I just wanted to get well ASAP instead of taking things slowly and letting my healing take place. So i went berserk. I bought all kinds of products immediately, not caring if they all would clash when used together... which is obviously a big NONO duh. So yes.. as per Point #1 and #2.. less is more. Go simple and you won't go mad. Remember: Mental health is just as important as physical. Be positive and your body will follow suit! My allergy is on week 3.... so yes it's going to take a total of a month to fully recover, but that's fine because its about 80-90% gone so I no longer want to throw my mirrors away. Most allergies take a month -3 months even, so don't give up too much hope okay! Things will always find a way back to being okay! P/S: If all else fails, then indulge in some retail therapy to tide yourself through this period! It always makes me feel better :). You can even shop while savings through using exciting offers available through deals and coupons here! Here's to youthful skin for all of us!